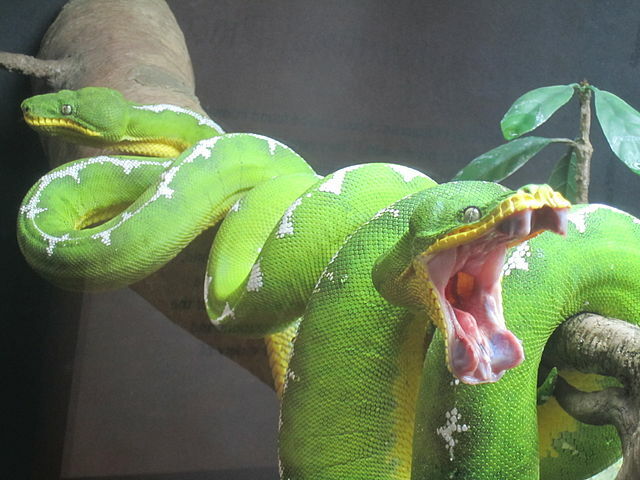 Emerald tree boas are non-venomous snakes native to South American rainforests. 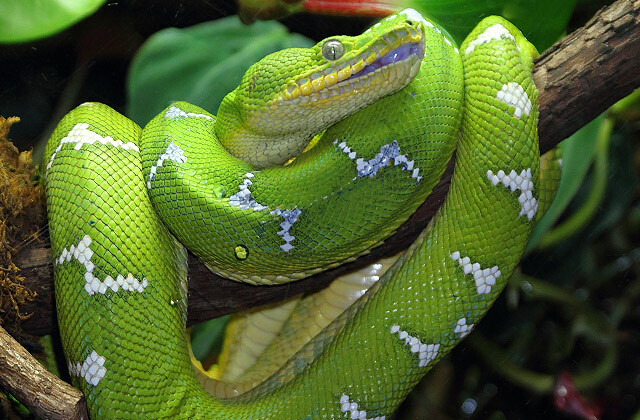 They earn their name from their emerald green body while the white zigzag “lightning” stripes covering their backs help in distinguishing them from other South American snakes. Distribution This includes the countries of Venezuela, Colombia, Peru, Bolivia, Guyana, French Guinea, Suriname and Brazil and covers the entire Amazon basin. 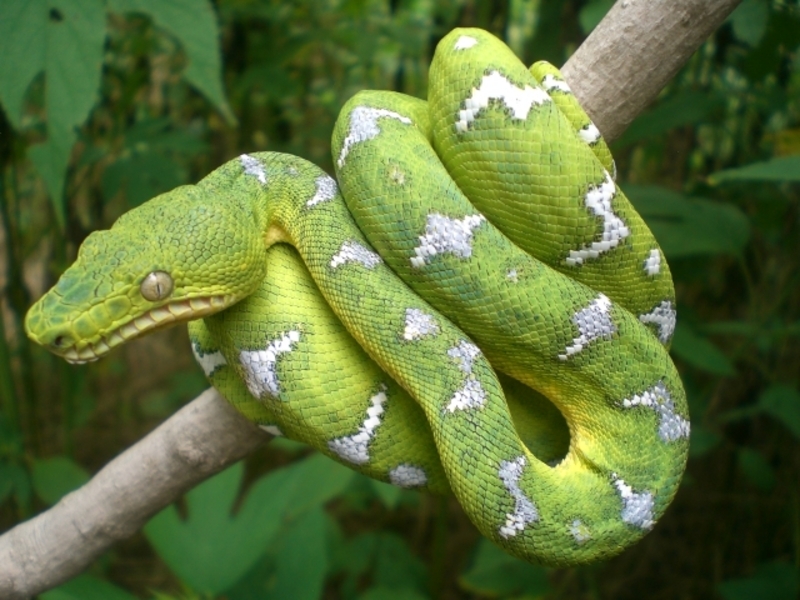 Emerald tree boas are found in the dense canopy foliage of wet, lowland forests. These reptiles are nocturnal and ambush prey during the night by picking them off from the ground. They are inactive during daytime and stay motionless in the form of a loop with their head in the center. Earlier, it was believed that emerald tree boas used to eat only birds as they can catch birds in flight. 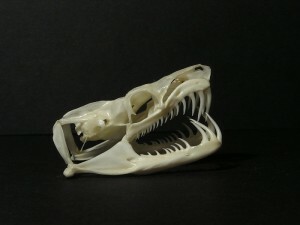 Their sharp teeth penetrated the feathers of the birds and gave the snake a strong grip before coiling the prey. 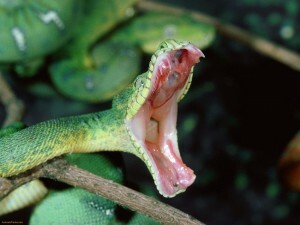 However, now it has been found that emerald tree boas prefer to eat mammals, especially rodents like the rice rat. 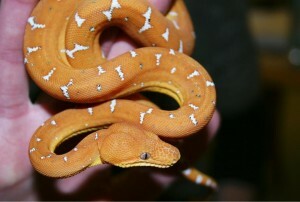 These snakes are ovoviviparous with the young being born alive. The clutch size usually numbers from three to eight. The gestation period is quite long, lasting for around seven months. During this period, they rarely feed but engage in basking. These reptiles usually breed once in two years. The females tend to lag behind the following breeding season because of their long gestation period and the size of their brood. However, sometimes all the eggs may remain unfertilized, or a litter may only have a single baby. The emerald tree boa babies can be born in a combination of various colors like yellow, green, orange or brick red. The color starts changing once they cross the age of six months to one year, gradually taking on the brilliant emerald green that is characteristic of the adults. This phenomenon is termed as juvenile polychromatism with the juveniles coming in various different colors. 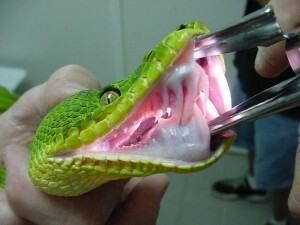 This is probably an adaptation to mimic the multicolored vipers, helping the babies to avoid predators. As they grow older, they resort to camouflage as a means of protecting themselves in place of mimicry. Males reach reproductive maturity at the age of three to four years while females need another year to be ready for breeding. Their vertical pupils, resembling those of a cat, help them to track movements easily. The deep pits present in the proximity of their mouth help them to detect heat that is emanated from their prey. These reptiles are endowed with a strong prehensile tail that helps them in moving from branch to branch. They are masters of camouflage and their bright green coloration and white stripes in between helps them to blend into the arboreal environment around them. The name caninus is derived from their angled snout and posterior bulges on the side that resembles a dog’s head; their elongated maxillary fangs are also similar to the canine teeth of dogs. The green tree python and the emerald tree boa are great specimens of convergent evolution; this shows how a similar environment has resulted in two unrelated species in having similar characters. The emerald tree boa is a popular choice of exotic pet. They are solitary animals and do not get any parental care. 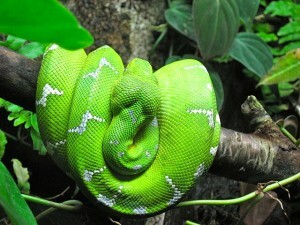 Male emerald boas are smaller than the females; they are also more coiled, having larger spurs. Published on August 8th 2015 by admin under Coniferous Forest Animals.